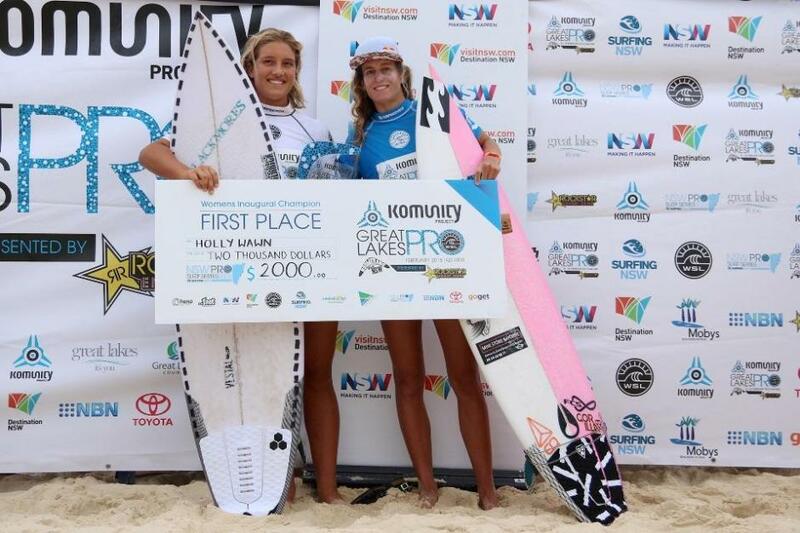 In the best conditions seen throughout the event window, Wade Carmichael (Avoca, NSW) and Holly Wawn (Newport, NSW) have been crowned champions at the first ever Komunity Project Great Lakes Pro presented by Rockstar Energy Drink with finals held in pumping five-to-six foot waves. In the final Carmichael came up against goofy-foot powerhouse Dimitri Ouvre (Saint Barthélemy). Carmichael posted his second near perfect 9.90 point ride (out of a possible 10) of the event with two huge rail hacks on a solid set wave early in the heat. This along with another solid score had Dimitri chasing a near perfect 9.46 for the remainder of the heat. Ouvre came close on a few waves, but was unable to take the lead away from a rampaging Carmichael. Ouvre was the dark horse of event posting huge scores throughout all of his heats with massive backhand re-entries on some seriously heavy sections. This result is the best result his career. The women’s final saw the two biggest standouts of the event go head-to-head as Wawn met the winner of last week’s Central Coast Pro, Justine Dupont (France). Dupont hit the lead early until Wawn found a set wave and unleashed a huge vertical snap, followed by a critical lip-line floater to post a 9.25 leaving Dupont needing a near perfect 9.65. Dupont - knowing her capability to post huge scores - didn’t give up, taking a wave in the dying minutes but fell just short, posting a 9.05; gifting Wawn the biggest win of her career. Dupont pushed her hardest right to the end posting near excellent scores all event and heads into the Newcastle and Manly QS6000 events with the confidence of a first and second place finish in just one week. 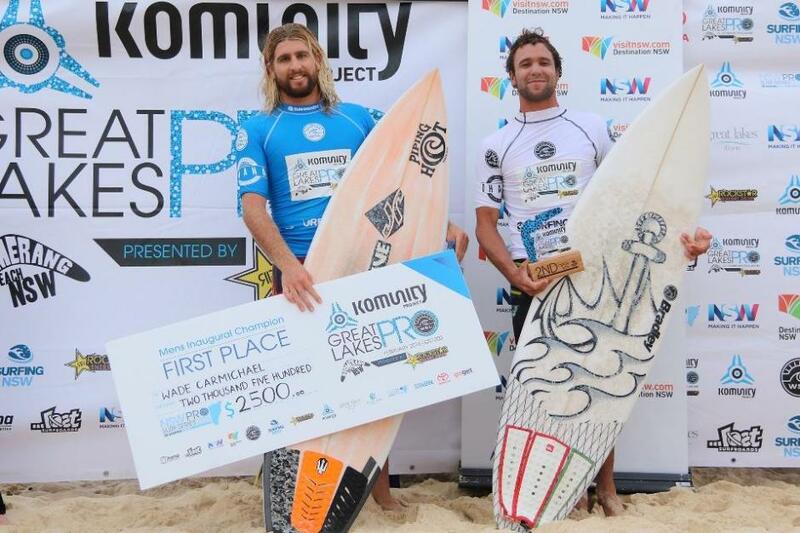 The Komunity Project Great Lakes Pro presented by Rockstar Energy Drink was the final instalment in the New South Wales Pro Surf Series, the overall series winner for the men’s was decided today. Although bowing out of this contest yesterday, a win at the Tweed Coast Pro saw Western Australian Jacob Willcox take the overall series win. He won himself not only bragging rights, but $1000 for his efforts. Mikaela Greene (Yallingup, WA) is the overall NSW Pro Surf Series champion after rival and series contender Philippa Anderson was eliminated from the event. Despite both surfers being knocked from the event in round three, Anderson still mathematically needed to claim victory at the Komunity Project Great Lakes Pro presented by Rockstar Energy Drink to claim the overall championship. For more results and information go to www.worldsurfleague.com or on the WSL App. The 2016 NSW Pro Surf Series was proudly supported by the NSW Government through its tourism and major events agency, Destination NSW. The series is also proudly supported by Randwick City Council, Gosford City Council, Destination Tweed, Great Lakes Council and Tourism, NBN, GoGet, Lost Surfboards, World Surf League and Surfing NSW. A new annual series of surfing events, the NSW Pro Surf Series will be held over the next three years at four beaches along the State’s coastline. Report and Photos by Ethan Smith/Surfing NSW, 2016.